Looking at the photo there is no doubt about who is the male in the pair. Anyone roaming in nature almost certainly sees or notices otherwise the mating games of ravens. In March their activities already concentrate on the nesting territory. 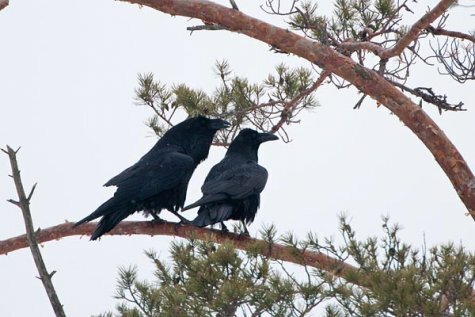 Ravens are not as numerous as the other corvid birds in Estonia but there are some five thousand breeding pairs. The plumage of ravens is black, as are the legs, beak and even eyes. There is no blacker bird – “raven black". The raven pairs spend all the year together if everything has worked out well for them. Large, clever, prudent birds but curious too, on whose signs both furred and feathered creatures in the forests act. Body length is about 60 centimetres. The weight of large males reaches up to one and a half kilos, the larger of the females a couple of hundred grams less. We will talk more about ravens in their nesting period. Arne Ader describes how one raven, fleeing from the other, quickly hides in a tree crown but the chasing partner doesn’t notice this, swishing past the playmate, and so gets a quite humanly understandable set-down, which can even be seen in their behaviour towards each other later. 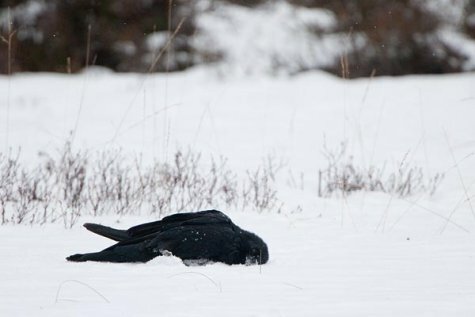 Ravens romp happily in snow, they even know how to glide, not speaking of throwing themselves on to the ground as we see in the photo.